It isn’t easy to describe a meal at Bona Cucina. 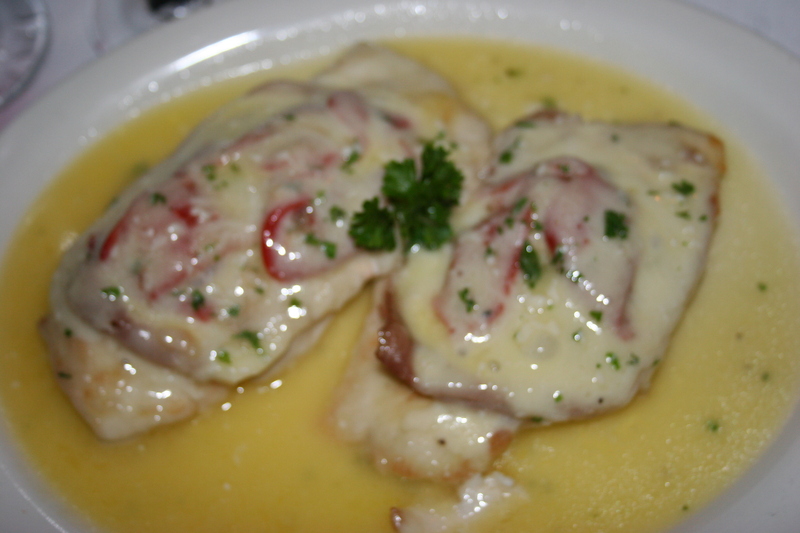 When you read the reviews you will see that virtually everyone raves about the food. When you do see complaints, they are usually about the service. 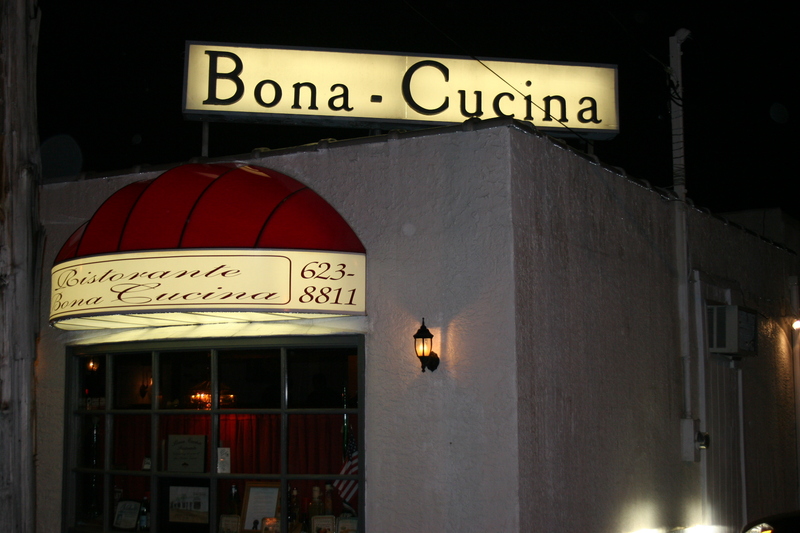 It just may be that Bona Cucina is not a place for everyone and the reason is, Bona Cucina is a place you have to “get”. You have to understand what it is and what it is not. It is quite simply, a small, intimate, local restaurant with an extremely loyal core of diners that comes back again and again for three reasons. The first is the fantastic food, the second is the consistently excellent food and the third is, ok, you guessed it, it’s the incredibly magical touch of Pat Buonadonna, Chef/Owner of Bona Cucina. What it is NOT, is a fancy, pretentious setting for haut cuisine. Tomorrow’s menu will be virtually the same one they had 10 years ago. They are not attempting to create “nouveau” dishes, nor are they trying to invent new ways to attract diners intent on finding the “hot new BYOB”. It’s not likely Craig LeBan from the Inquirer, who recently reviewed the neighboring Sycamore Restaurant, will be dropping by soon. You will be able to count on Pat’s wife, Frankie, being out front to take orders, entertain, whisper the latest rumor and make sure you feel welcome. You can’t be in a hurry at Bona Cucina. It’s a place to relax, converse with your dinner companions, drink some wine and your food will be there when it’s done cooking. 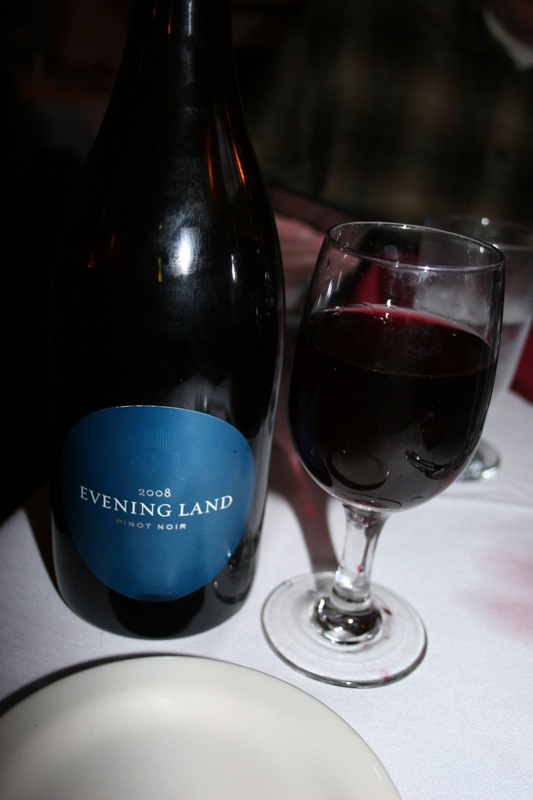 Last night I had the 2008 Evening Land, Pinot Noir, Oregon. The 2008 Pinot crop from Oregon is getting rave reviews and the Evening Land should have a few of its own. The wine was crisp with fresh strawberries mingling with cherries and soft plums to create a flavor profile that went well drinking on its own and with my entree. Speaking of entrees, I was determined to order something other than my personal Bona Cucina favorite, the Chicken Celeste. I’m getting ahead of myself, though. 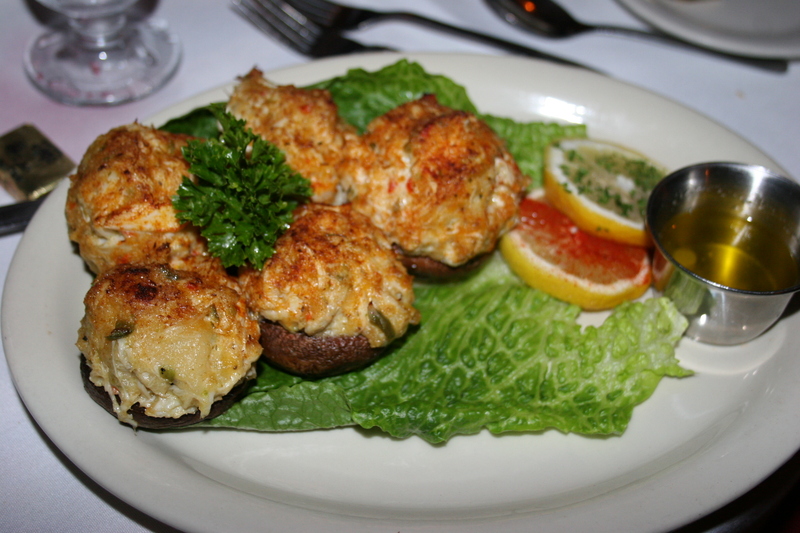 We started with several of the guys splitting an appetizer of stuffed Portabello mushrooms. Not being a mushroom kinda guy, I passed on what everyone thought were absolutely delicious starters filled with tasty crabmeat and cheese. 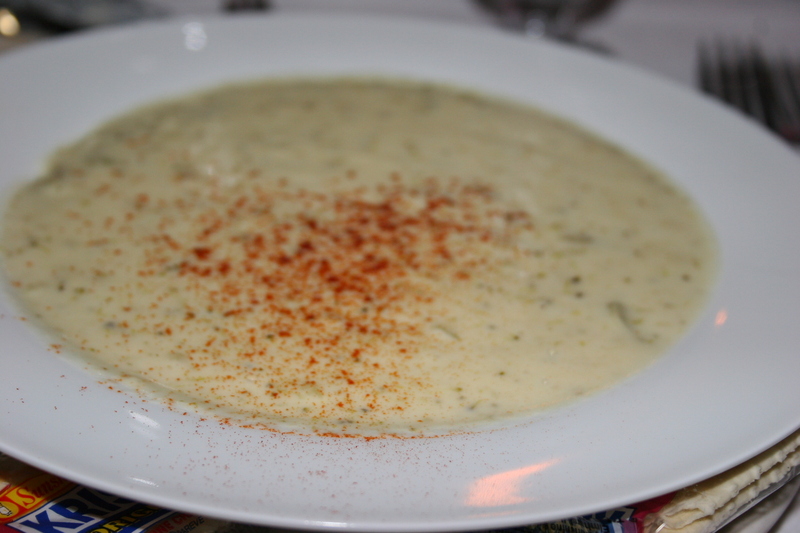 I was tempted, but refrained, and ordered the soup du jour which was a Cream of Broccoli. I can honestly say that I have probably had over 100 different cups or bowls of cream of broccoli soup throughout my life. This one was, hands down, the BEST. I can’t even think of words to describe the taste. It was simply liquid perfection and I’m pretty sure that Val, who had a cup himself, was equally impressed. I had raved so much about the Chicken Celeste that Val ordered it. It looked every bit as good as I remembered it from three previous visits and Val finished half and took the other half home for another meal. One of the evening’s specials was something called Chicken Genoa and it sounded similar to the Chicken Celeste and gave me the opportunity to feel somewhat proud of myself for breaking with personal tradition. 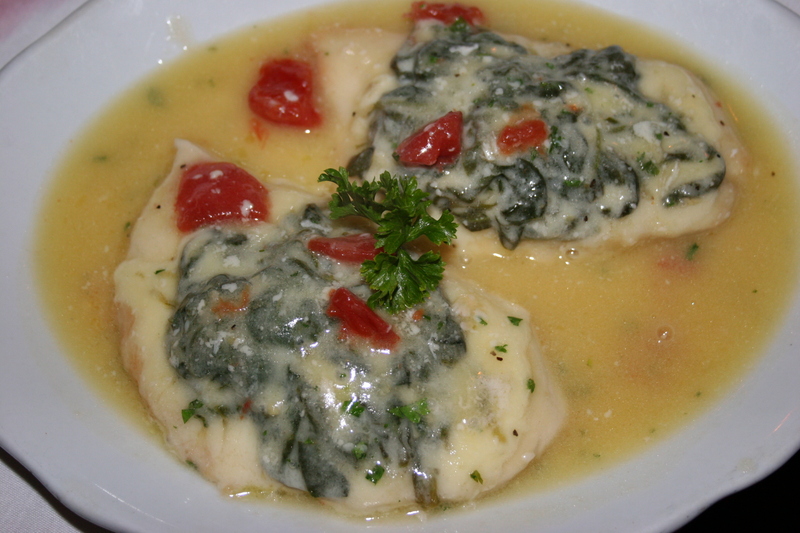 The two generous portions of perfectly cooked chicken breasts were topped with spinach and provolone cheese and were scrumptious. 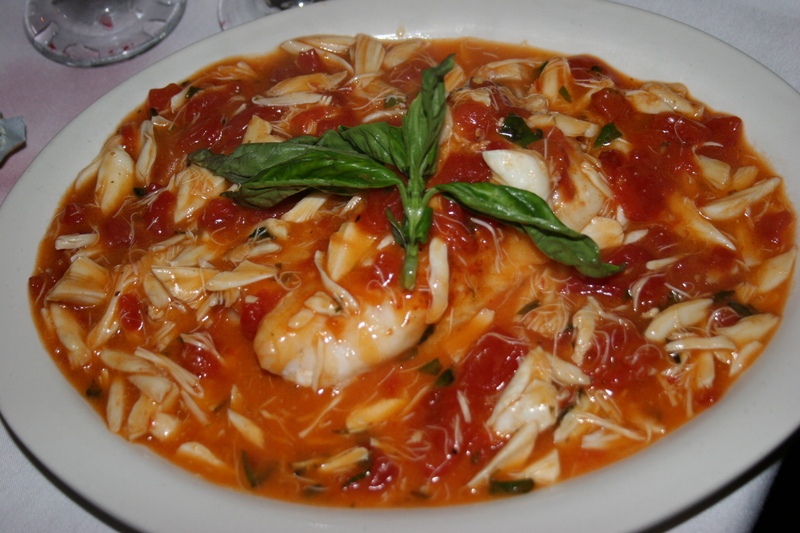 Frank D. and Ange also ordered from the “specials” and chose the Orange Roughy with crabmeat in a spicy red sauce. It looked terrific and their relative silence while devouring the large portion seemed to confirm that they were enjoying each and every morsel. Steve J., possibly celebrating the fact that he finally was paid his “NCAA Tourney” prize money, ordered the Scallop entree. 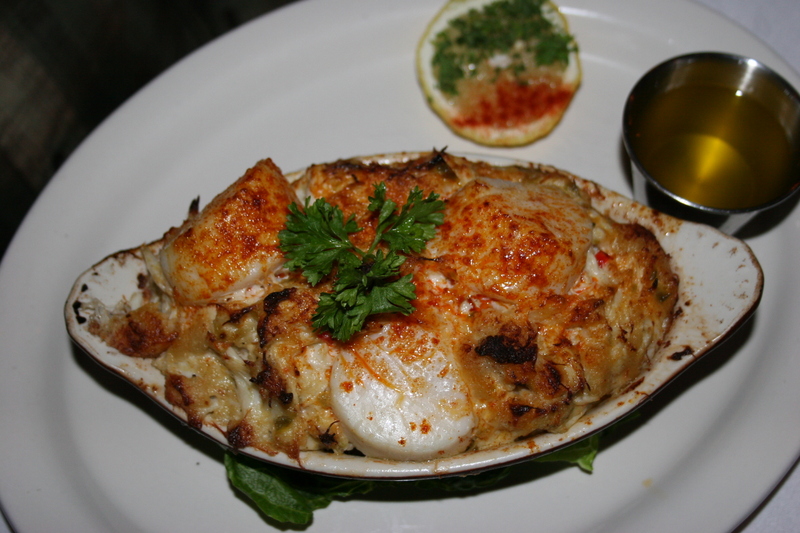 The dish was huge and looked appealing with lots of nicely cooked tender scallops and crabmeat. Everything that comes out of the kitchen is just chock full of flavor. 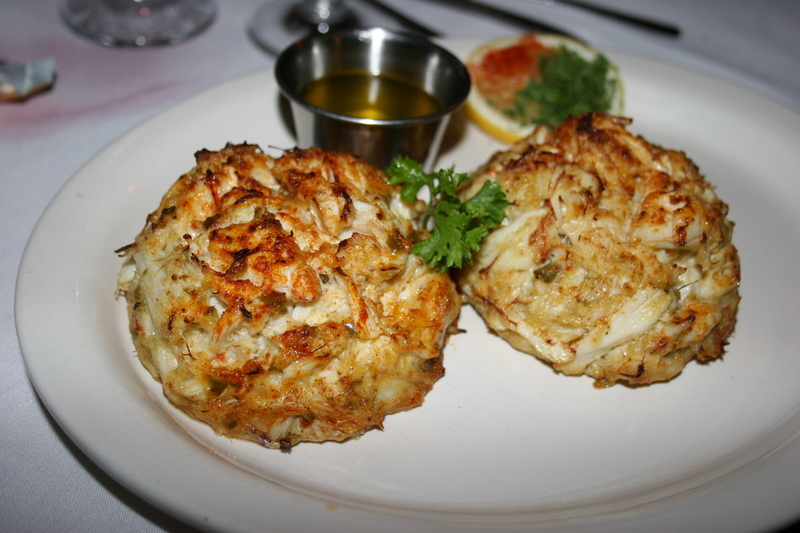 The sixth member of our dining party, Mr. Thomas H., a welcome if infrequent guest, selected the Twin Crabcakes. It was very evident when these two tempting mounds appeared that there wasn’t much filler being used to hold them together. It was just lots of tangy crabmeat molded into a couple of great looking wonders from the sea. All of the dishes came with your choice of a side of pasta or the veggie of the day which was green beans. As usual, it was another night of great food and conversation. We closed with one dessert, six small plates and six spoons. The Chocolate Bomba was just the right treat to put the finishing touch on a wonderful meal. Rich chocolate and creamy vanilla ice cream in a chocolate coated ball with a cherry center and plenty of whipped cream. Frankie had destroyed the ball prior to bringing it to the table as she knew everyone would want a taste. That’s why there is no picture. What I do have is another memory of a great meal at this inconspicuous little gem of a restaurant in Upper Darby. Some day, maybe in another 20 or 30 years, Bona Cucina will even have its own website. On second thought, they probably won’t because the people who know and “get” Bona Cucina will keep coming back without a lot of fanfare. I think Pat and Frankie are quite content with things just the way they are.